Interview with Art Fawcett | Keikari.com Interview with Art Fawcett | On classic men's style, elegance and the beautiful life. ‘I’m 63 and a hat maker. High school, 2 yr. college, 4 yr apprenticeship in Masonry. I have one son who is interested only in as much as I am so involved. My parents have passed but my siblings are very proud of my work and reputation. In the late 1980s I bought my first “old car,” a 1932 Buick and joined a touring auto club. As part of this experience, my then wife and I started researching the clothing of the era so that we could dress the part while driving ala, 1932 clothing in a 1932 auto. Things progressed quickly and in very short amount of time she had opened a vintage clothing shop in our home, then a store, then a bigger store, then our own building, it goes on and on. By the time we retired in 2005 we had built one of the largest and most respected clothing stores in California. When in the vintage business, one is confronted with a decision fairly quickly as to the direction. There is always today’s “fad” or there classic lines and fabrics that are timeless. In the 1990s the Japanese buyers were paying up to $1K for a Hawaiian shirt so dealers scoured the earth to find them, only to discover the fad was over and they had inventory that was worth 1/3 of what they invested (at best). We decided early on that we must not chase the fad, but rather set the tone through classic lines and fabrics. Some things are timeless. As part of that business, even though I was a full time Masonry Contractor in the San Francisco area, I started learning how to clean, reblock and enlarge old hats, making them either saleable for the store or rentable for the films (we were involved with over 150 films) by taking the old ones apart and trying to reverse engineer them. Learning materials are basically non-existent, so trial and error is the only way in most cases. Although there was a hat maker in San Francisco, he was extremely protective of knowledge and downright unfriendly to anyone he saw as a potential threat. In that process, I started collecting the equipment to make the job work, I still collect equipment, along with buying up all of the vintage ribbon I could find so that after years of collecting I had the appropriate ribbon (era) for the approx. year of the hat I was renovating. 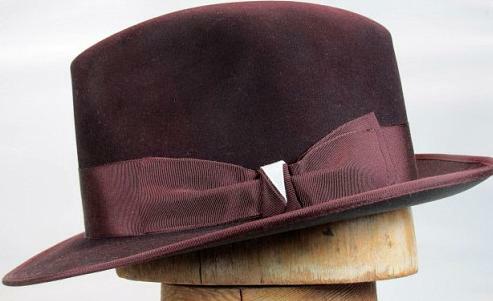 Trying to use a modern ribbon on a 60 yr old hat just didn’t look right to me and I assume it wouldn’t look right to everyone else. My style is mostly vintage/classic. My favorite era for men’s clothing is the 1930’s with the hourglass tailoring, so I favor that look. Being thin, I’m able to find much of what I like. After retiring from the Construction and vintage world in 2005, I sold most of my clothing and moved to the mountains of Southern Oregon so my wardrobe is beginning to take shape again now that I have moved back into town. I have no favorite RTW designers but often like Lauren classics and Zegna designs. I am a builder, so I help with charities that build homes for the underprivileged in my area. I am learning to cook and really enjoy that also. After retiring in 2005 we bought land and moved north. Once the initial building phase was done (we bought raw land, no roads, power, conveniences) I realized I still needed to earn the some monthly income because I was too young for Govt. pensions so we added a hat workshop to the buildings. I had been a member of The Fedora Lounge almost since its inception so I came to look at its members as “extended family”. 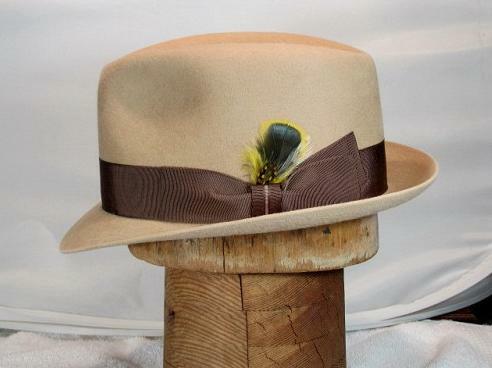 When trying to decide how to make my hobby, hatting, a business, I decided to make only ten of any one design so that I never got bored, made up one design to show out of scraps I had in boxes in the shop, and posted it online in the Fedora Lounge. I honestly had no idea if there was a market for what I did and for my style of hat making, so when the first design sold out (all 10) in 36 hours I was stunned to say the least. I had my answer, I needed to get busy developing it from hobby to business in a hurry. After 7 yrs now, I finally feel that I have a handle on the industry and am about as prepared for the future as anyone can be. In the process, I believe I have become the most copied hatter in the industry via the color stripes my works are known for. I make classic lines and styles, but with a twist. I always want people to notice the materials used in the hats I make (beaver, beaver blends) but what I hope for is what I call the “double take”. Have you ever noticed something or someone as you walked by them and realized something was different, but not flashy, so you had to look again? That is the “double take”. I try to make my work stand out but in a subtle way most of the time. I’m known for my “color stripe” in the knot of the ribbon, very thin, quite contrasting yet quite subtle. The angles of the bow tips, the shades of ribbon, the texture of the felt, the innovation of the ribbon design, all are trademarks of my work. I have been blessed with a client base that realizes I am an artist at heart and allow me the freedom to quite often design and innovate on hats commissioned by them. I have a client in Paris who loves to be the first in the world to own new designs, so often when I have an idea that I don’t know whether will work or not, it will be worked out and sent to this client to be introduced to the world. That gives me the freedom I need to explore and at the same time offers a certain pride of ownership for my clients. How could life be better? If I had to describe my work in one sentence I can do it in two words: Quiet elegance. 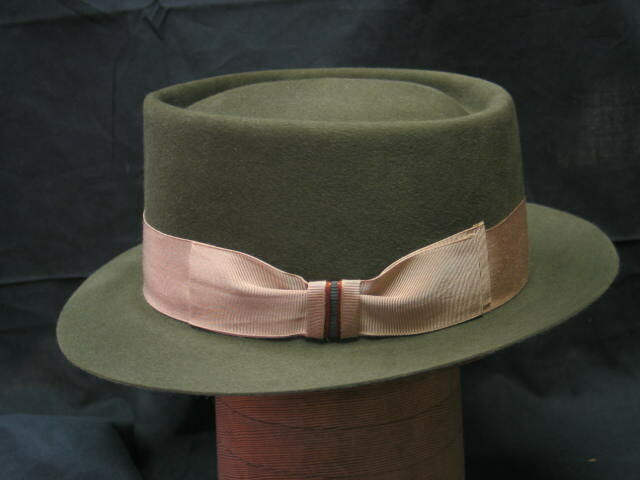 As a Bespoke hatter, it can only work one way. 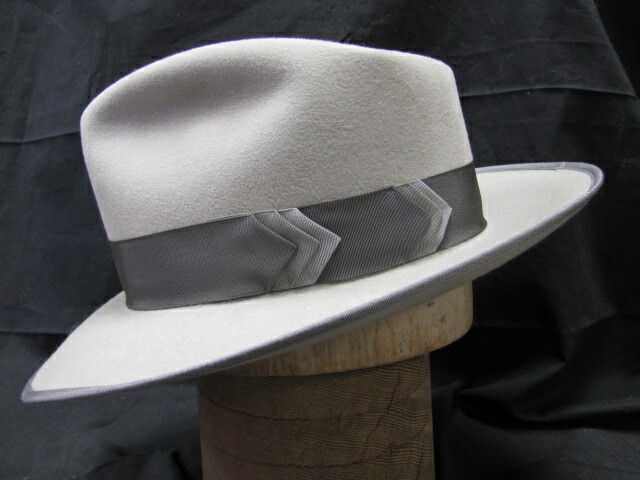 Once a decision is made to commission a hat, I send a package with a conformer and felt samples to my client. The client uses the conformer, tightens everything up, and sends it back to me. That way I have not only the client’s size, but head shape as well. 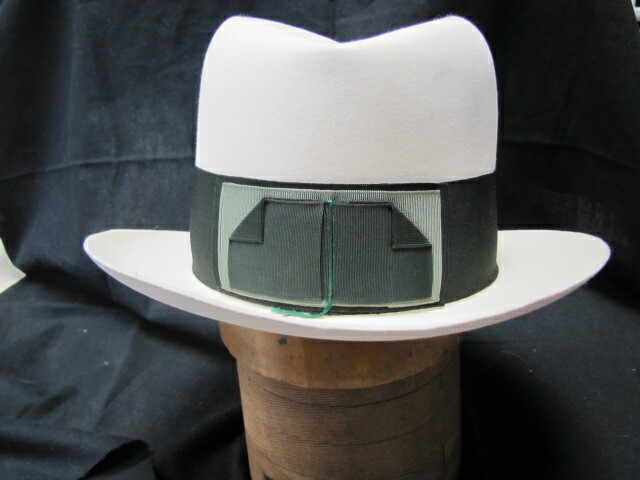 Once the material colors and dimensions are discussed and agreed upon, often using pictures of the client to determine the best proportions for them, the hat is built to their head shape. I often also make what is called a “band block” of my client’s head shape and keep it in storage, so the second time the client orders from me, all that is needed is consent and details. 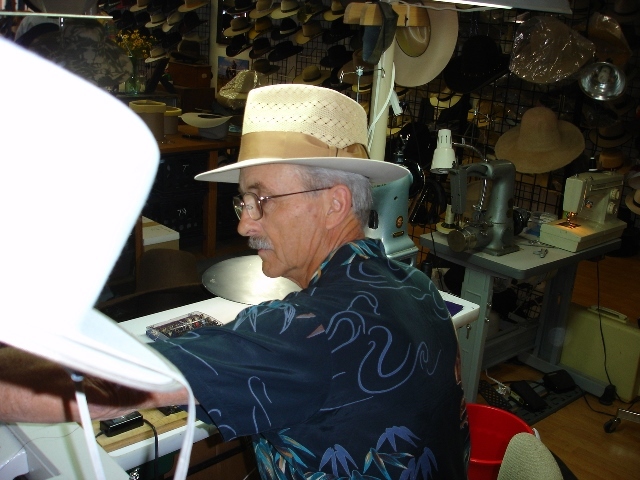 If you count western hatters, there are many more than a dozen true hatmakers in America. Why should one choose VS? Quality, pure and simple, and attention to details that make a difference. My grandmother always used to say “God is in the details,” but it took me until adulthood to understand that it’s the little things, like spending the extra time and money to get it right on the fit, to the extra expense to get the finest leather for sweatbands even though most wouldn’t know. Getting it right means taking the extra steps even and especially when nobody is looking. Inspiration comes from everywhere. A few years ago I was asked to build a hat that would honor my client’s “Native American” heritage and it had me stumped for quite some time, until I realized the term didn’t only apply to the US and looked south. What I came up with was a ribbon design that assimilated the Mayan and Incan culture of pyramids and made the hat with tails at a 45 degree angle, resembling the step pyramids of Mexico and south. My client was so excited he named the hat “Pyramid of the Moon” and that began what I call my “Native“ phase in which I fold ribbons of different colors to form designs. Last year I was in Los Angeles and was invited to a play in downtown LA. It was at a theatre that was part of a complex, and after the play my friend and I sat for a glass of wine and to talk when suddenly water sprang from seemingly everywhere, coming from a water feature built into the concrete and shooting it in the air at different pressures creating not only city light reflections through the walls of water, but doing it at different heights. 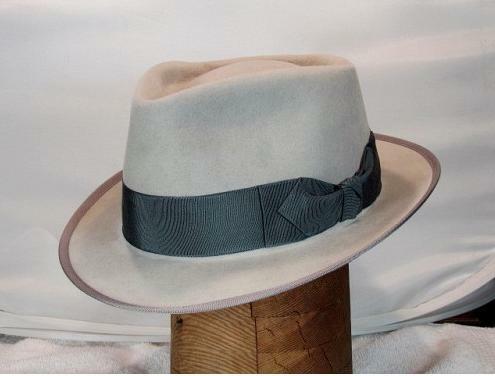 It was marvelous and I immediately started seeing a hat in my mind’s eye that would later become a one of a kind hat, owned by my friend, we named the “Chandler” after the Dorothy Chandler Pavilion in LA. My favorite designer of all time is actually an automobile designer named Alexis De Sahknoffsky. He designed the Auburn, Cord (I think), countless designs using the streamline as a basis. He designed streamlined trains, boat tail cars, simply ahead of his time. 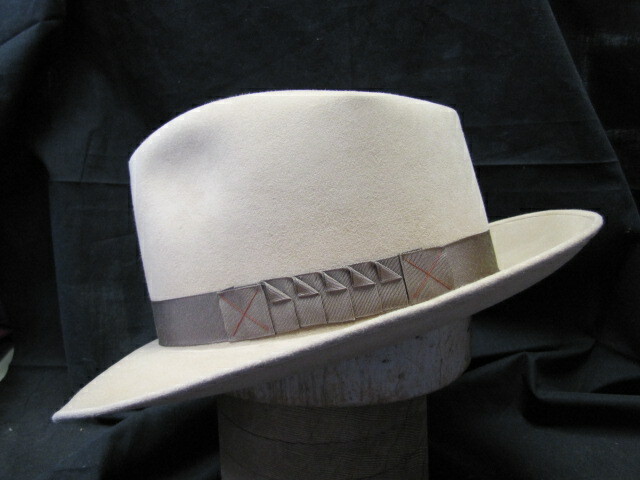 If you study my hats you will see a lower, sleeker, longer feel to them than others. Style is the creation of a positive image rooted in the idea that beauty is in the eye of the beholder. There are basic rules for fitting hats to face shapes that are covered in many places on the internet, so please start there. Once a basic specification (brim width, etc.) is determined from what you read, then start building hats a little taller or the brim wider than recommended to get a feel for it. 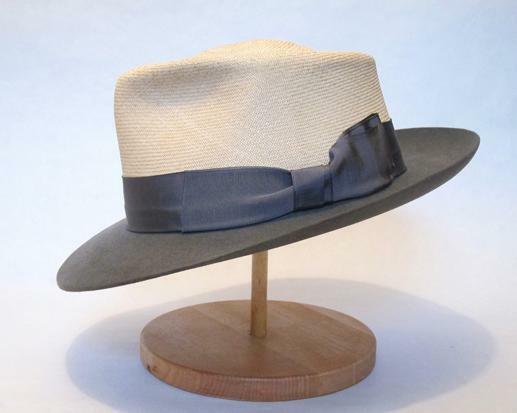 You can always crease (bash) the hat lower or cut the brim shorter, but you will at least start with many options. The right specs will come about much like picking a tie for your suit. Once you put the suit on the bed and start putting neckties on it to see the effect, the right one always appears. Please understand that I grew up wearing hats, so it seems and feels natural to me under all conditions. The expression goes, “wear the hat, don’t let it wear you”, but what that means is “be brave and confident“ and that is what people will see, the confidence, not the hat. As a small man in stature, I grew up always being the smallest in the crowd and developed a sense of dread when in crowds or especially walking into restaurants. I felt that everyone was looking at me and it was very intimidating. In my early 20s I experienced some success in my career and was respected as such but couldn’t get past that fear walking into the diner, so I made up my mind to first hold my head up, throw my shoulders back and straight, and tell myself just before going in that “I OWN this place”. The first few times I did so, it felt very awkward but funny enough, after only a few times I was receiving more respectful greetings from those employed to do so, getting better table placements and friendlier-than-expected service. Why? I think because my attitude told them that I expected that kind of treatment and respect, so that’s what I received. Please bear in mind, though, I did not make demands, was not loud in any way, I simply assumed and expected good service and almost every time received just that. That’s certainly one of the goals Keikari’s interview series has, to dig deeper and get a grasp of the thoughts and philosophy behind those featured. Art OWNS his hats. I’m a proud owner of two of Art’s hats and they are quality works of, well, art. He has been very patient with my requests and the end results come out looking amazing! After reading this interview, I have a greater appreciation of his philosophy of style which I try to follow myself: simple, sleek lines with an extra little touch that catches people’s attention. I just wish I was aware when he was around in the Bay Area so that I could’ve enjoyed the shop he used to have.